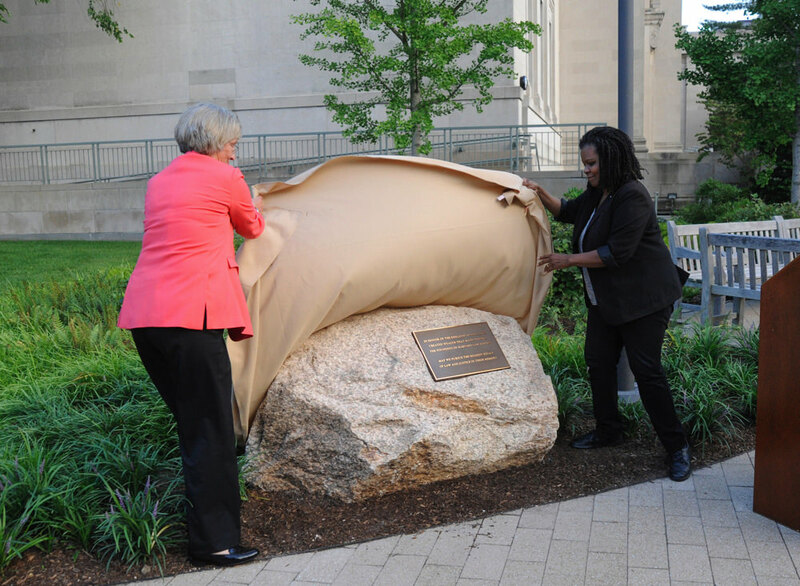 President Drew Faust and HLS professor Annette Gordon-Reed unveil a monument dedicated to people enslaved by law school benefactor Isaac Royall. Phoebe, Plato, Abraham. Betsy, Diana, Belinda. There were about 60 names in all, a shocking number, Halley noted, but still only a fraction of those whom the Royall family owned. Inside Wasserstein Hall earlier in the evening, listeners had heard some of that complicated history from Warren visiting professor of American legal history Daniel Coquillette. The author of On the Battlefield of Merit: Harvard Law School, the First Century, he spoke not only about Royall, a brutal slave owner whose plantation in Antigua was notorious (he kept a 500-acre farm in Medford, too), but also about the school’s connections to the Fugitive Slave Act of 1793—which most faculty members at the time strongly supported, Coquillette said, and which former dean and Supreme Court Justice Joseph Story was reluctantly instrumental in enforcing in 1842, when he sent back into slavery a woman who’d escaped to Pennsylvania and her two free-born children. Twelve years later, faculty member Edward Greeley Loring, a federal magistrate in Boston, ordered escaped slave Anthony Burns returned to Virginia under the 1850 Fugitive Slave Act, a decision that led to riots; Burns had been defended by Richard Henry Dana, A.B. 1837, LL.B. ’39, LL.D. ’66.